Firewall - Inheriting in-product IFS authorities from a higher directory, streamlined rules support for multiple libraries, web application server performance improvements, SQL long names and more. We recently recorded a number of highly informative training sessions for our customers. User Profile Management, including coordinating user profile definitions between multiple systems, is an increasingly critical management and security-related concern. 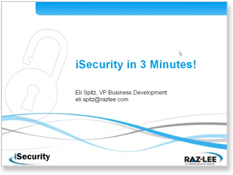 iSecurity is the preferred solution for comprehensive User Management in Power i. The Visualizer graphical business intelligence product assists in analyzing User Profile reports and all queries initiated via Firewall, Audit and AP-Journal. And...Visualizer will soon support FileScope also! Visualizer is a unique product on the market because of its ability to instantaneously filter millions of log records and "drill-to-the-data" to find the specific log record corresponding to a suspicious security breach! Raz-Lee's R&D department is now finishing the development of a Stand-Alone version of Visualizer, which will be able to connect to any JDBC-connected database on any platform. We invite you to view our Visualizer product; afterwards, we are certain you will want to use these really valuable products on your system!